TV is a favorite entertainment devices. One remote and we can see the latest updates and entertain ourselves happily. These devices nowadays becomes the status symbols too and LED TVs are huge in size, needs more protection than other devices. For safeguard these devices and make it look organized , there are TV cabinets or TV units available online and offline furniture stores. You have option of customization and you can design your own media unit as per you TV. The TV cabinets are perfect safeguard of the TV and other supporting devices like modem, set-top-box, wires, and other things as well. The bigger the TV the bigger the need of install it with safety and full protection and it can easily get from the TV cabinets. The TV cabinets are available in different designs and styles. The different dimensions and styles makes every TV cabinet or Tv unit different and perfect for your TV. The entertainment center or full size TV cabinets are made only for your big sized TV and LED TV. These TVs need the safer place where, they didn’t get any harm from kids and other things. These cabinets has enough number of drawers and shelving. You can easily place the other supporting stuff with the huge TV. It is made of different materials, available in different sizes and make the best appeal in the room. 2) Wall Mounted TV Cabinets: The wall mounted TV cabinets installed on the wall and doesn’t take the floor space in the room. The wall mounted TV cabinets are perfect for the compact spaces and saves a lot space of the floor. The Wall mounted TV cabinets are versatile and can be placed anywhere in the home. You can use these units in the shop, living room, guest room, and bedroom. These comes in different materials, different shapes and sizes as well. You can make your any room decorate with TV with the wall mounted TV cabinets. 3) The Cantilever Wall Mounted TV Cabinets: This type of TV units are half wall mounted and half open shelving, the bottom of these TV cabinets is in form of round pipe and it takes less space in the room. The bottom has less number of drawers and have sleek flat surface settled on the round bottom. This sleek flat surface is best for slim TVs. 4) Corner TV cabinets: The corner TV cabinets are perfect for those corners which are uneven or unused. These TV cabinets have triangle shaped back for covering center of the corner. 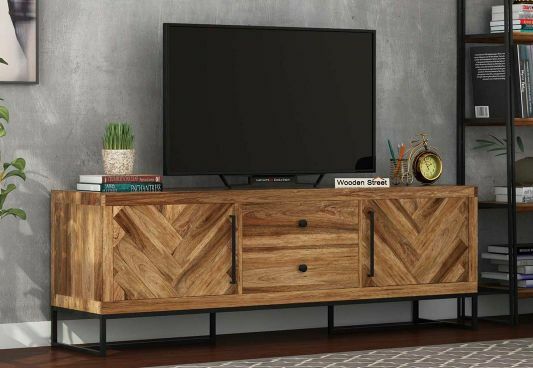 These TV cabinets are perfect for any type of home decor and blank corners. These TV cabinets saves a lot of space and demanding in the modish home decor. 5) Hideaway TV cabinets: This type of TV cabinets are perfect for those houses, where TV is not watched so often. If this situation is of your home, you should try this cabinet for your TV. This TV Cabinets has covering to hide the blank space of the TV while not in use. These units conceal the screen and protect your TV screen all the time while not in use. Conclusion: The TV cabinets are important furniture units and available in different types, materials, styles and storage capacity. 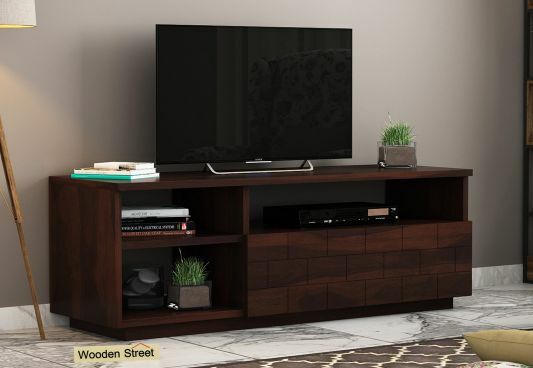 The wooden TV cabinets are in demand and always looks classy in every type of home decor. I hope you can now choose the perfect TV cabinets for your TV and make it safe and look classy. These units make your home decor more classy and organized and home all the other supporting devices.